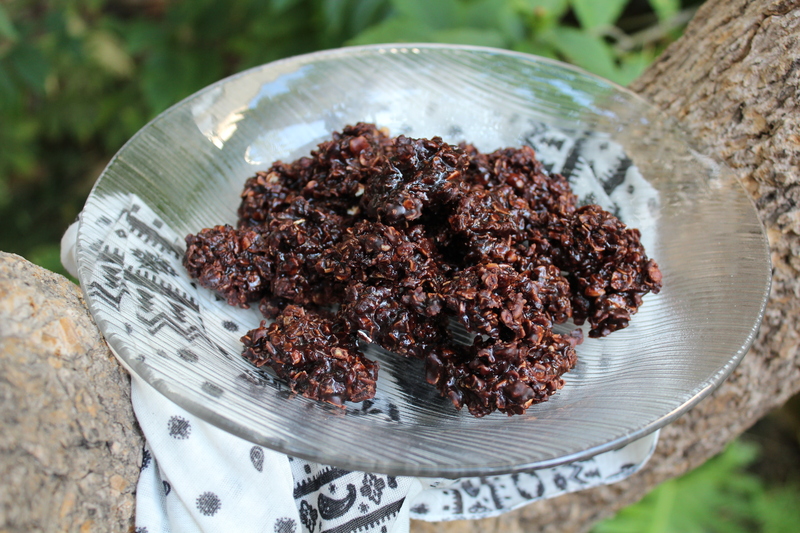 These no bake cookies take less than 5 minutes to whip up, and I have to say that the cookie “dough” is best eaten when it is still warm and gooey. 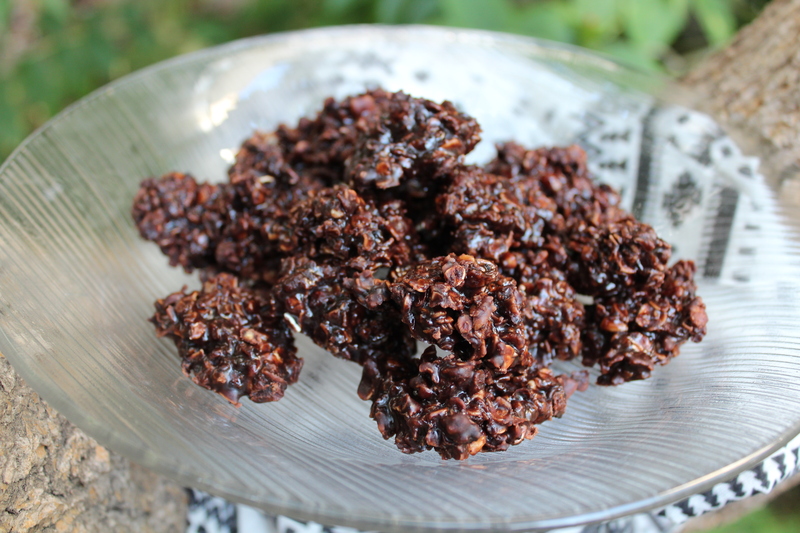 They are decadent and chocolatey with the perfect kiss of peanut butter. Once you’ve eaten half of it alongside a tall glass of cold milk, plop spoonfuls of the rest on a tray and refrigerate them. Because sharing is caring. 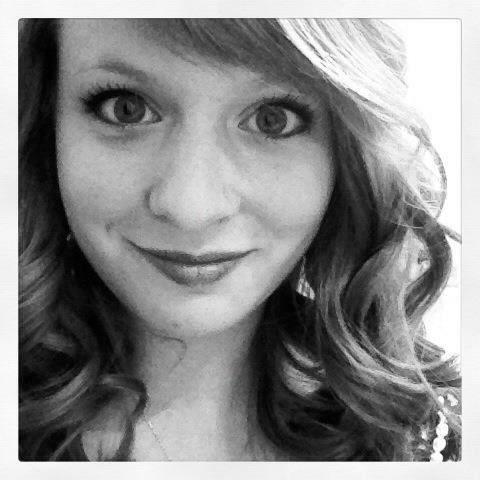 My life has been a whirlwind of change lately. One month ago I packed my bags, kissed my cat goodbye, and flew across the world to live in Israel for 5 months. You can read about my adventure here. It took me about a day to feel at home here, and it took me about a month to feel homesick. It’s funny how you can make a recipe that reminds you of home and suddenly not feel so far away. My Mom has been making these for us for as long as I can remember. Consequently, I made these four times this week. All four times I shared them with my roommate, friends and neighbors, and all four times I thought of home. Makes no cookies if you eat all of the cookie dough out of the pan. Makes 15-20 cookies otherwise. 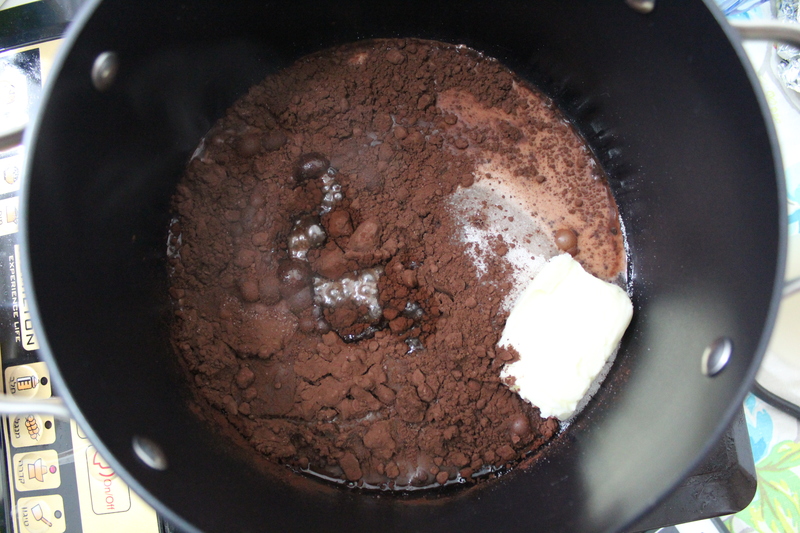 In a pot over medium heat, mix together sugar, milk, butter and cocoa powder. Bring to a boil for about 1 1/2 minutes, stirring constantly. Remove from heat and add peanut butter and oatmeal. Mix well. Spoon into bowls and eat immediately for instant comfort and homesickness relief. Or drop by teaspoonfuls onto a tray lined with wax paper and refrigerate. A note on the cocoa powder: I have always made these at home with baking cocoa (like the Hershey’s kind that you find at the supermarket). That is totally fine and they will be delicious no matter what, but if you can find a more rich cocoa powder it makes a huge difference! In Israel the cocoa that I bought is so decadent and flavorful, it makes me want to buy 100 containers and take them home with me at the end of my stay. I don’t know about you, but chocolate is a really necessary thing in my life. My Granny makes the best brownies in the world, hers are fudgy and dense and perfectly chocolatey. Whenever she comes to visit she brings a container of them; somehow they just taste better out of her oven, not ours. Last week I had a craving for brownies, but I was so sick of the packaged gluten free kind from the store. I wanted warm brownies fresh out of the oven! And I especially wanted dense, fudgy brownies like my Granny’s. These brownies are actually best served cold in my opinion, but they are also great still warm. With a hand mixer, cream the butter and sugar together. Add the eggs, then the remaining ingredients. The batter will be really, really thick and really tempting to eat straight out of the bowl. Take a stick of butter and peel the paper off of one of the ends. Rub the butter all around an 8×8 metal baking pan, covering all nooks and crannies. Then scoop about 1/4 cup sugar into the pan and, over a sink, tilt the pan around until the sugar coats all of the butter. Firmly pat the bottom of the pan (over the sink!) to remove any excess sugar. Pour the batter into the pan and smooth it down with a spatula. Bake for 20-25 minutes. Brownies will be soft in the middle, let them sit on the counter for 20 minutes before serving. They are best served cold, though. Be sure to put keep the brownies in the refrigerator once they are done to retain freshness, they really aren’t good if you keep them out on the counter. recipe adapted from oh lardy! 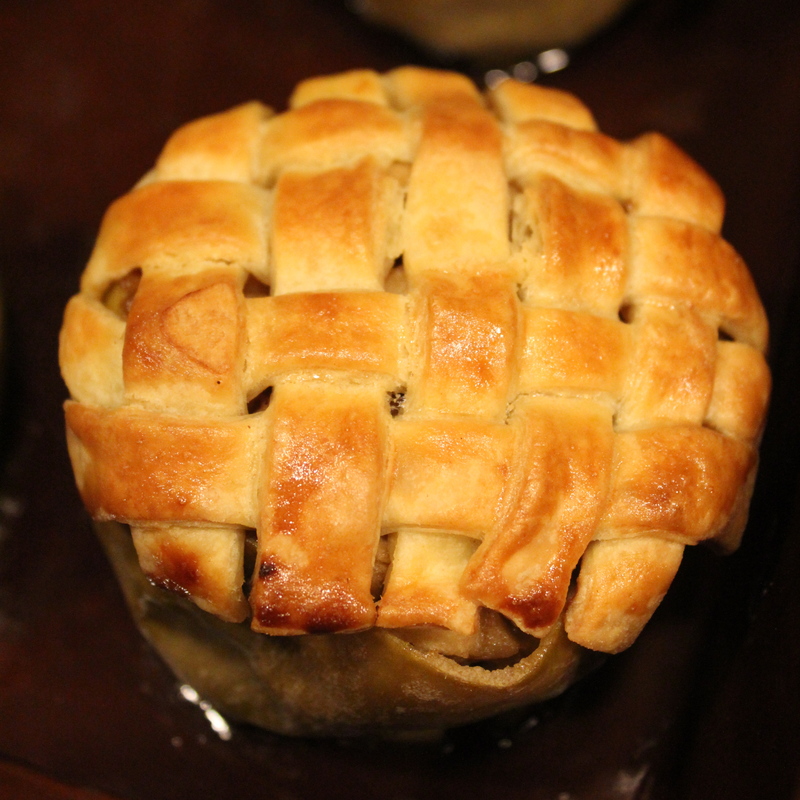 Apple pie is a classic that is generally saved for crisp autumn days when the breeze is just right and the apples are ripe to perfection. 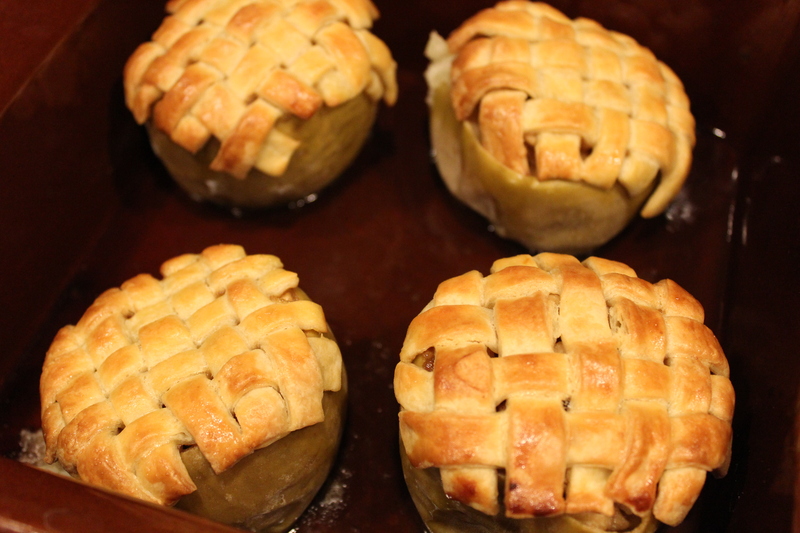 But when a close friend of mine requested mini apple pies baked inside the apples, with an adorable and quaint woven crust, I couldn’t resist. Birthdays have always been a big deal in my family, and this has seamlessly translated into my adult life. The mere fact that the goodies that come out of my kitchen can translate to happiness will never cease to amaze me. These applies were huge and heavy, full of juices. Combined with brown sugar and a dash of cinnamon, it was autumn again in my kitchen. I personally think that baked desserts, especially those with fruit, have a place on the table year-round. So maybe it’s an unseasonably cool summer night, maybe you’re craving something sweet and comforting, or maybe you want to try your hand at grilled desserts. Either way, I hope you get a chance to make these. Prepare dough as in this recipe. 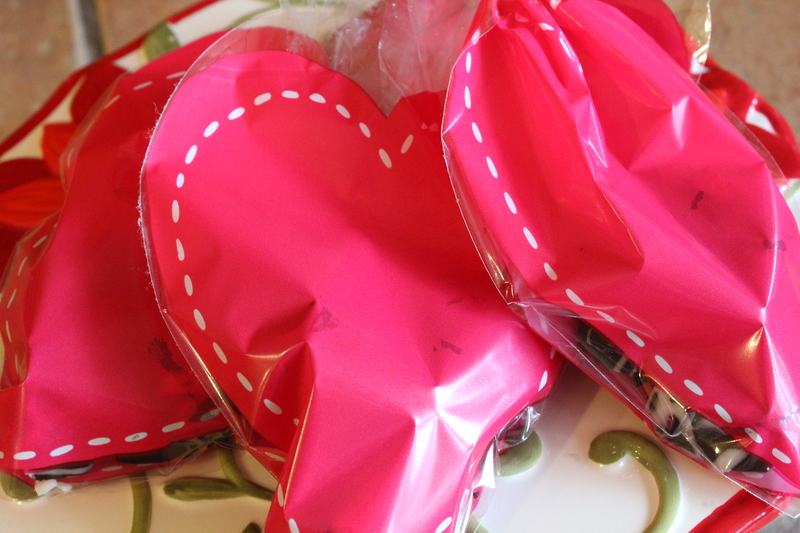 Wrap with plastic wrap and refrigerate for one hour. 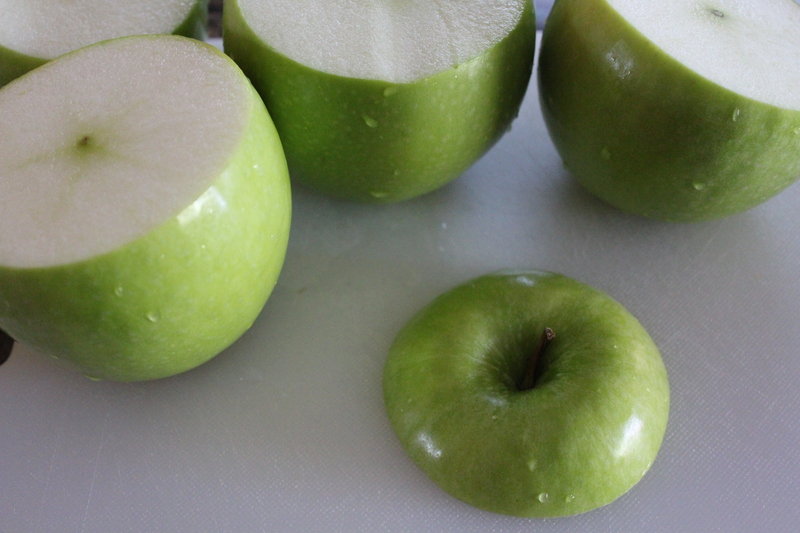 Meanwhile, wash each apple and evenly cut the top off of 4 apples, save the 5th one for the filling. Discard the top. With a melon baller (this is the easiest way, trust me), scoop out the apple flesh, leaving 1/4 inch of flesh (or more) attached to the skin so that you have apple cups. They’re adorable, aren’t they?! 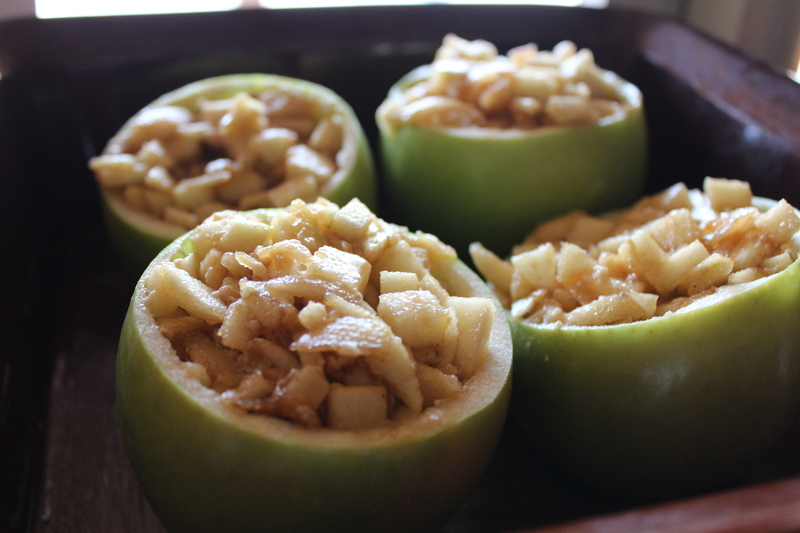 Discard the scooped apple parts with seeds and chop the rest into rough pieces. Peel and cut the 5th apple to make roughly 3 cups of chopped apples. In a bowl, toss apple chunks with brown sugar, white sugar, cinnamon butter, flour and water. 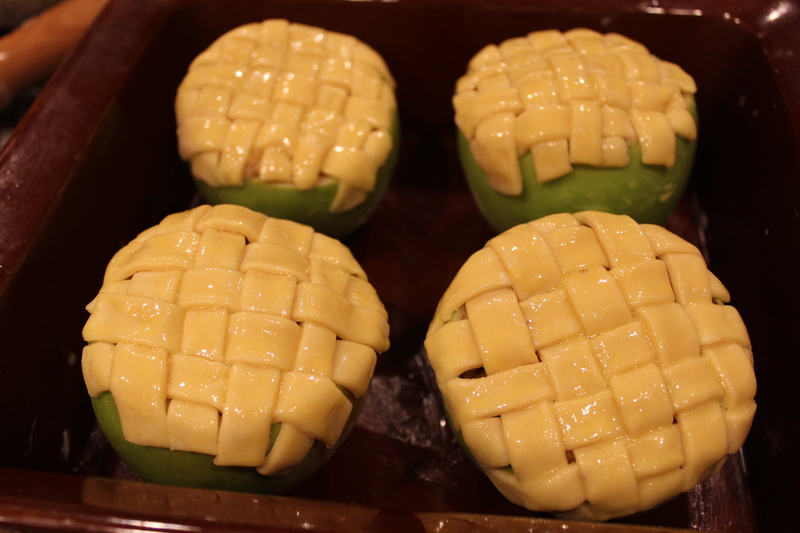 Scoop the filling into the apple cups. Place the filled cups into a greased pan deeper than the height of the apples. Pre-heat the oven to 375 degrees. Roll out the dough onto a floured surface and cut into 1/2 inch-thick strips, about 5 inches long. 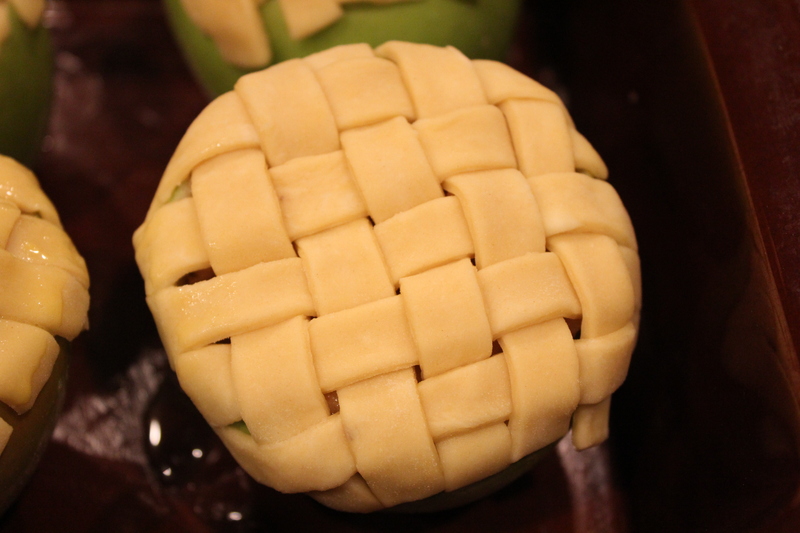 Weave tops and carefully place in top of each apple. Brush the dough with an egg wash, cover the pan with foil and bake for 30 minutes. Remove the foil and bake for 20 minutes or so, until the tops are golden brown. Enjoy with a scoop of vanilla bean ice cream on the patio. I know, I know; girls are supposed to love chocolate, blah blah blah. But seriously! I would be willing to bet that not a day goes by that I don’t sneak at least one square or an embarrassing number of bonbons. If you share this ailment with me, then maybe you have daydreamed about homemade chocolates before, but cast the idea off as silly or difficult. 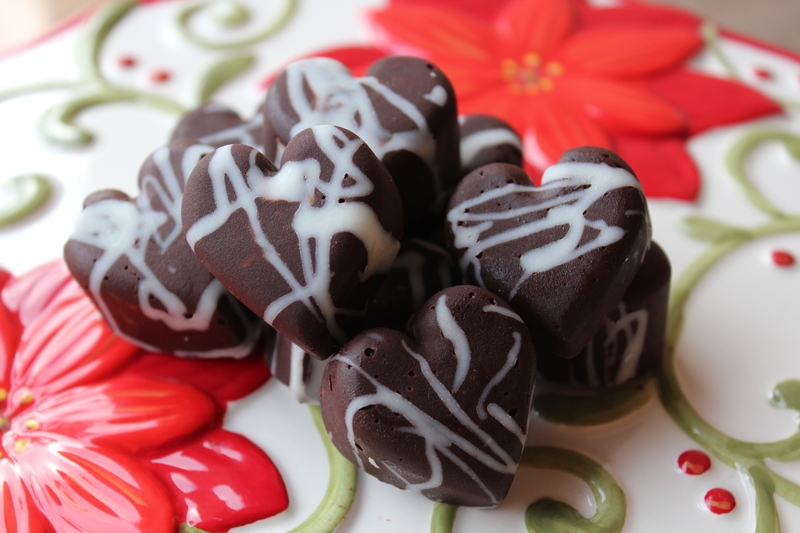 I mean, why take the time to make your own chocolates when Trader Joes does a fantastic job already? I hear you, but when you make your own chocolates you have complete control! You put whatever you want in them! So, maybe you’re craving dark chocolate and peanut butter and coconut all in one smooth, satisfying bite. Or, if you got the last minute shopper gene like me, right now you’re searching for a hasty (and easy!) 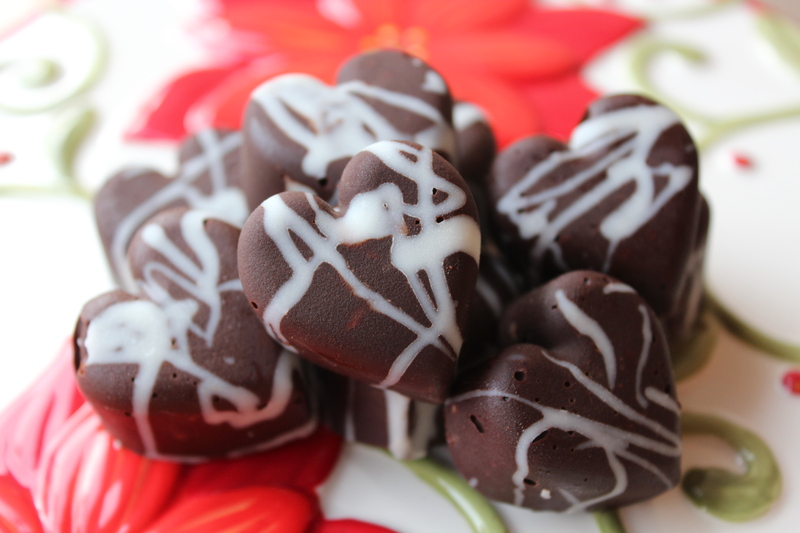 homemade treat to give to your sweetheart this Valentine’s Day. Either way, you’ll fall head over heels for these little hearts! 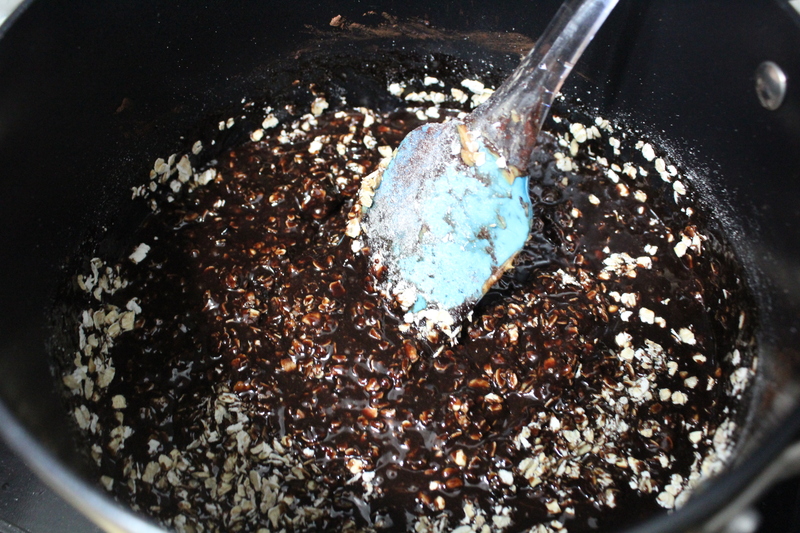 Prepare your double boiler: Place 2 inches of water in a pot and heat to a simmer. Place the metal or glass bowl on top, careful that the bottom of the bowl does not touch the top of the water. Melt the white chocolate*: Add the white chocolate to the bowl and whisk often, until almost melted and some chunks of chocolate are still visible. Remove the bowl from the pot and carefully wipe off any condensation on the outside of the bowl. Remember, water and chocolate are not friends! Continue to whisk the white chocolate until it is melted. 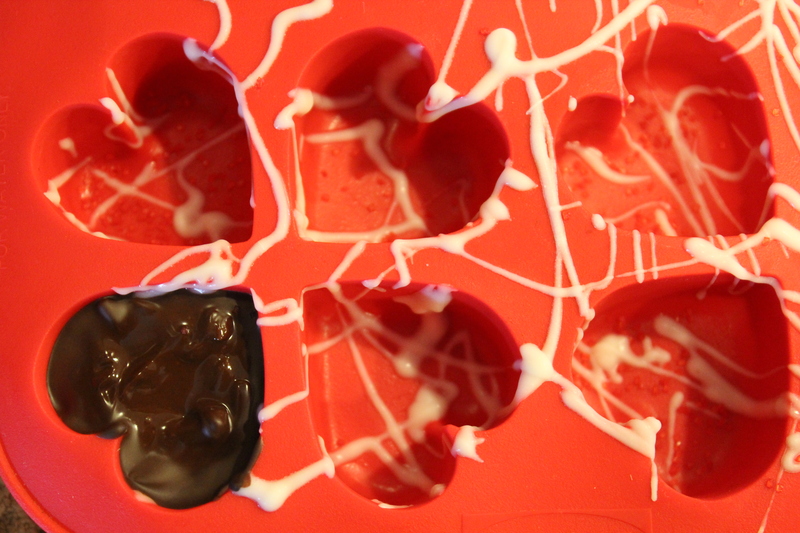 Smear a thin layer of coconut oil inside each heart mold. 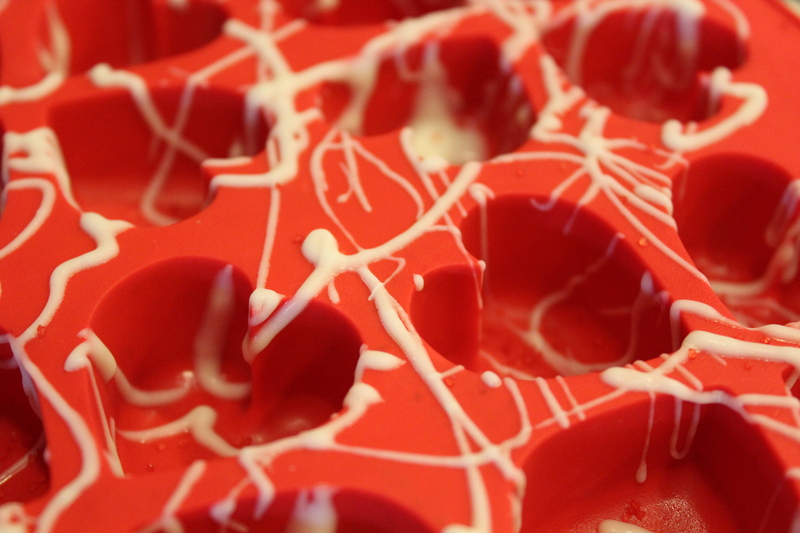 Drizzle the melted white chocolate across each mold and place in the freezer to harden. 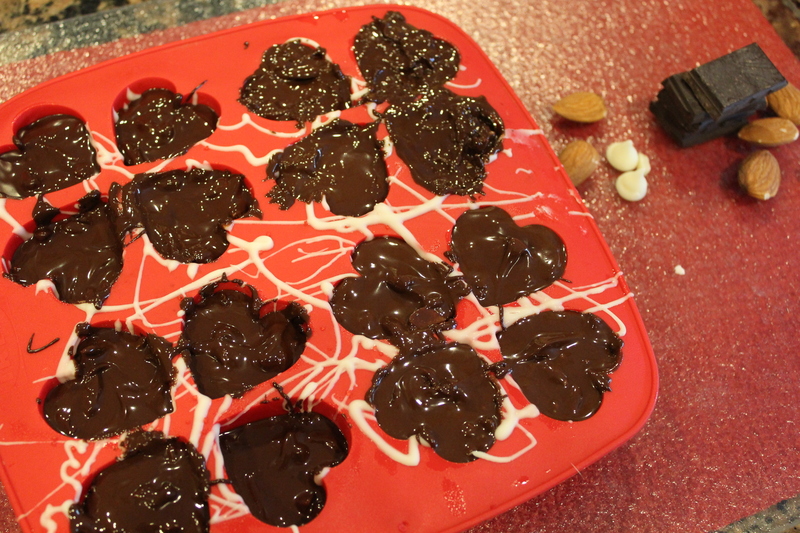 Once the chocolate is melted, add peanut butter and coconut and/or almonds. Fill each mold and place in the refrigerator to harden, about 2 hours. Even if you don’t have a sweetheart this Valentine’s Day, I urge you to celebrate love with those dear to you. I hope you have a lovely love day! *These instructions are not for tempering.